A species of small frogs endemic to the Sierra Nevada is causing a rising swell of consternation across the region. 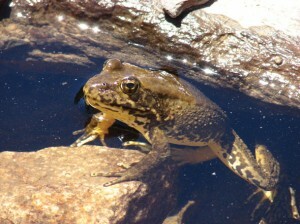 The Sierra Nevada yellow-legged frog was once ubiquitous in the pellucid lakes and crystalline streams dappling the granitic mountains, particularly in the range’s northern reaches. “It was difficult to walk around many of California’s alpine lakes without tripping over these diminutive ‘mountain gnomes,’” says a website for the Center for Biological Diversity, an Arizona-based organization that advocates for wildlife and ecology and originally petitioned to list the frogs as endangered. “The frogs are on the verge of extinction,” says Robert Moler, spokesman for the U.S. Fish and Wildlife Service (FWS), the regulatory body that administering decisions relating to the Endangered Species Act of 1973. Yellow-legged frog populations have dwindled significantly due to a confluence of factors, including habitat fragmentation, disease and the practice of stocking alpine lakes with non-native fish amenable to sport fishing, biologists say. “One of the major risk factors is the trout stocking that occurs throughout lakes in the upper elevations,” says Tahoe National Forest wildlife biologist Tina Mark. The California Department of Fish and Wildlife has stocked lakes with non-native fish as a means of encouraging recreational fishing for decades, but the agency is in the process of doing a watershed by watershed analysis in an attempt to determine where it is appropriate to stock, Mark says. Another huge factor is the proliferation of a disease afflicting frog populations throughout the world—the Chytrid fungus. Chytridiomycosis is an infectious disease responsible for devastating global amphibian populations, by some estimates affecting 30 percent of amphibians worldwide. There is no way to curtail the vectors of the disease, which causes 100 percent mortality in some amphibian species, and sporadic deaths in others. “The Chytrid fungus has affected areas across the whole Sierra,” Mark says. In fact, the disease has not only decimated populations of the Sierra Nevada yellow-legged frog, but the mountain yellow-legged frog, which lives in the southern portions of the Sierra Nevada, and the Yosemite toad. FWS is considering listing the three amphibians as endangered species, and is currently compiling a draft economic analysis intended to analyze the potential impacts economic and otherwise to the region should the species be listed. Kirk MacKenzie, founder of Defend Rural America, says a federal listing would significantly encumber a suite of economic activities including dam building, irrigation, grazing, timber harvesting, fire management, mining, road construction and a variety of recreation activities in designated areas. He notes FWS is contemplating a designation of critical habitat for about 1.8 million acres throughout the high-elevation regions of the Sierra Nevada, which could effectively subdue a significant portion of eastern California’s economic resources. The area includes nearly all of Desolation Wilderness and other tracts to the south and west of Lake Tahoe. U.S. Congressman Doug LaMalfa, R-Richvale, has joined MacKenzie and others in a chorus of questions designed to extract specifics from FWS regarding how such designations could impinge upon the economy in an area of California that, unlike its coastal counterpart, has not rebounded well from the Great Recession. In the hearing, LaMalfa broached the issue of another endangered species—the Spotted Owl, a point of long-simmering contention between cattle ranchers, loggers, environmentalists, developers and conservationists in the northwestern United States. Scientists long identified habitat infringement as the primary factor in the Spotted Owl’s population decline, saying clear-cutting and deforestation impeded the bird’s ability to reproduce. The designation of a large swath of forests spanning Oregon, Washington and Northern California as critical habitat ground brought much of the once-mighty logging industry in those regions to a standstill. Recently, a gathering consortium of scientists are rethinking the Spotted Owl issue, with many defecting from the original position and claiming the species reduction is more attributable to the Barred Owl, which has expanded its range westward and outcompeted its comparatively passive spotted compatriots. The owl debate led LaMalfa, Mac-Kenzie and a host of others to worry inadequate science will lead to an unnecessary designation in the case of the three amphibians endemic to the Sierra Nevada. The proposed designation punishes industry and restricts recreation, LaMalfa says. FWS’s Moler has attempted to disseminate information designed to nip the alarmist rhetoric in the bud. “I don’t necessarily agree with that parallel as the habitat for the [amphibians] is different as it occurs mostly on wilderness lands and on public lands,” Moler says. Furthermore, a critical habitat designation does not necessarily restrict human activities in the demarcated zones. However, many of the foremost timber companies, such as Sierra Pacific Industries, rely on timber harvested on federally managed land. In exchange, federal forest managers often demand fuels reduction plans and ecological restoration plans be administered on forest land, says Tahoe National Forest supervisor Tom Quinn. A wellspring of concern centers on whether projects conducted in the areas specifically designated as a critical habitat within national forests will be indefinitely frozen. Recreation is not listed as a threat to any of the species, but ultimately each federal entity, whether it be the Lake Tahoe Basin Management Unit or Tahoe National Forest, will be responsible for implementing management decisions in relation to the potential designation, says Moler. 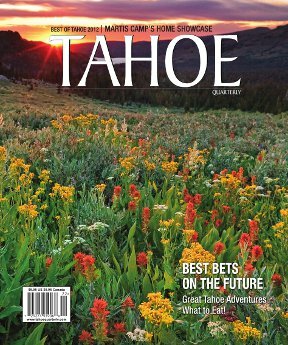 The Tahoe National Forest has several areas designated as habitat for the frog species, including lakes in proximity to the Sierra Buttes, the Granite Chief Wilderness, Loch Leven Lakes and areas near Donner and Independence lakes, says Mark. FWS plans to release its economic analysis in the autumn of 2013; the deadline for a final determination on the listing is slated for April 2014. Following its release, members of the public can comment on the findings and the proposed critical habitat rule. 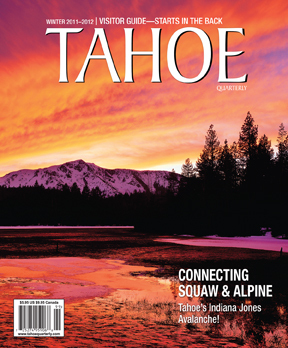 « Can Tahoe’s Cal Neva Swing Again?